Some Race Driver: GRID players are no longer able to play online, Codemasters has confirmed. 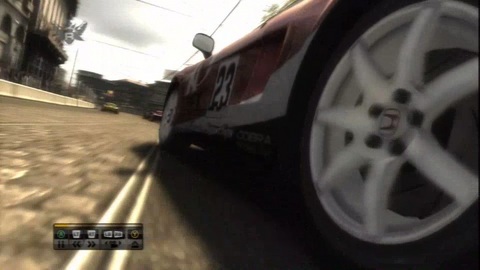 The UK publisher has discontinued online play for the PC and PlayStation 3 versions of the 2008 racer. The Xbox 360 version, however, remains unaffected. "After three years of service, 2008's Race Driver: GRID's online play service has been discontinued for the PS3 and PC editions of the game," Codemasters' Ian 'Helios' Webster said in a statement. "This follows the decision by a third party provider to decline the offer of an extended contract to continue online play on these platforms. "Race Driver: GRID for Xbox 360 is not affected. We thank fans for their support and apologise to those affected by the end of this service." GRID players have reacted angrily to the news. Codemasters' forum is packed with posts. "As a PS3 user I'm absolutely gutted, it's the only game I play online," wrote goonerjon777. 9/10 was the verdict in Eurogamer's Race Driver: GRID review. "Even if GRID doesn't give Codemasters parity with PGR in US sales, as the developer hopes, it's a fine achievement and an early leader in the race to be 2008's best driving game," wrote Tom.